When Jim asked me to submit something about my favorite opening shot from a movie, I was at first flummoxed -- it seemed all the best ones were obvious and would have been written on to death, so I dug through my memory to try to find a less-obvious choice. What I settled on was "The Crying Game." I was fortunate to see "The Crying Game" for the first time long before the hype about the "twist" kicked in, so I was genuinely surprised at the direction the film went in and I think, upon rewatching its opening, that the beginning was helpful to that end. 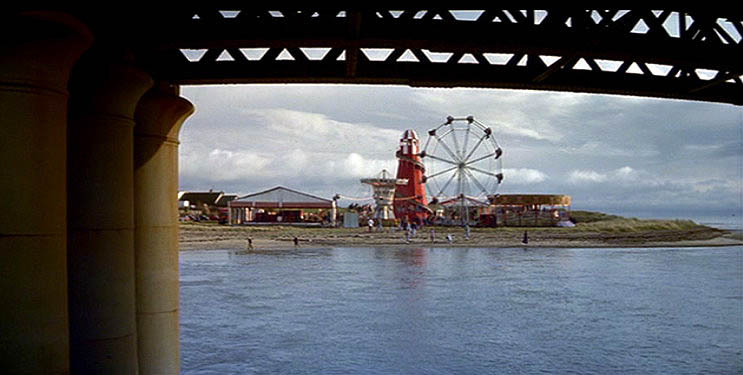 Percy Sledge's great "When a Man Loves a Woman" plays on the soundtrack (the irony of that song will only sink in later) as the camera moves slowly under a bridge across a lake where on the other side sits an amusement park with Ferris wheels and various rides going round and round. If you had no idea going in where this film was headed, you certainly couldn't have figured it out by these images, though you'd be mesmerized nonetheless. Almost pushed out of the right of the frame by a post. Once the song and the camera movement finishes, there is a quick jump-cut to within the park where we meet Forest Whitaker and Miranda Richardson on a presumed date, playing games before Whitaker ducks for a potty break with Richardson holding his hand. The only hint we have of what is to come is some brief shots of Stephen Rea paying close attention to their actions. Soon enough, Rea, Richardson and the other IRA members have abducted Whitaker and the film begins in earnest -- at least the first act. I realize that this sequence really constitutes more than an opening shot, but for 14 years I've remembered that slow camera movement and Percy Sledge and when you bounce that opening over the final shots, where the song has been replaced by Lyle Lovett singing "Stand By Your Man," you realize how perfect an opening Neil Jordan had devised. JE: Thanks so much, Edward, for reminding me of what a brilliant, poetic shot that is. It wasn't among the first to come into my mind, either, but you've persuaded me that it should have been! 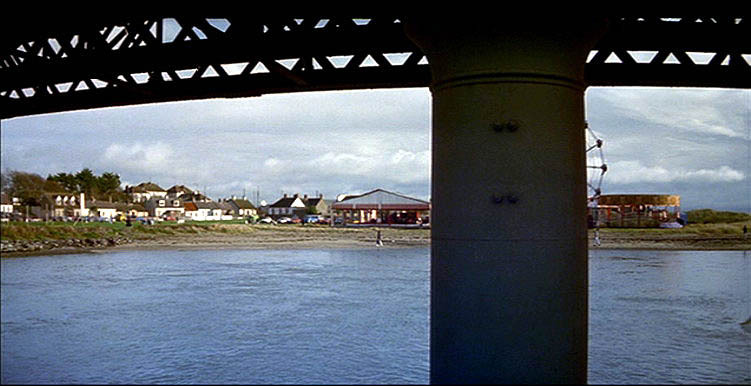 Not only does the camera move (right to left) under the bridge and cross to the other side, it also tracks a small, solitary figure (long dark coat, white pants) who walks left to right on the far shore, until he (?) reaches the edge of the water and can go no further. Figuratively, if not literally, it's Fergus (Stephen Rea) -- or maybe a black-and-white fusion/suggestion of where both Fergus and Jody (Forest Whitaker) are at this particular moment, when their lives are about to intersect. It's under this bridge where Fergus will encounter Jody (Forrest Whitaker) for the first time, interrupting a sexual encounter in progress. 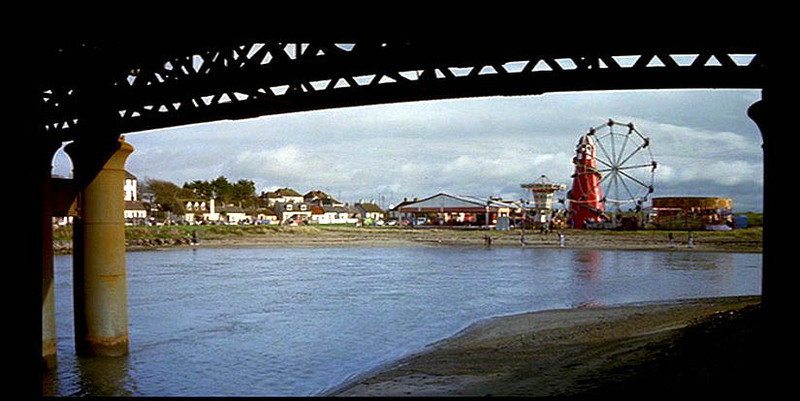 And "The Crying Game" is a movie all about bridges and barriers, natural and man-made. I don't want to insist on a single, "this equals this" reading of this extraordinarily resonant shot, but as you point out, it's accompanied by Percy Sledge singing "When a Man Loves a Woman," it's a crossing over (under a bridge), and it shows a lonely figure reaching a place where land meets water. Once you know the trajectory of the film, about a love that quite naturally crosses (some, not all) barriers of gender, and even death -- and you savor the delightful irony of the final song playing off the opening one -- you really see how beautiful it is. The final shot of the film reverses the movement, this time from left to right, with two lovers together, on top of a raised structure yet separated by glass (but only for another 2035 days! ), as we hear the great (Wellesian) story about the frog and the scorpion: "It's in my nature." "Stand By Your Man" indeed!